SIGNATURE*** MissManeater HEAVYMETAL zipper front crop top high cut 80's style hipster *** THONG cut! SIGNATURE*** MissManeater HEAVYMETAL zipper front crop top + high cut 80's style hipster *** THONG cut! we LOVE our SUPER cheeky #maneaterSTYLE! & there ain't nothing cheekier than our zipper bum thong hipster pant! Matching back to this zipper front sporty look crop top with adjustable bra sliders on the shoulder straps. Where it be for a photoshoot of you just LOVE to standOUT from the rest! Make sure you are wearing THE best! We have used the HIGHEST quality BLACK wetlook spandex withe METAL zipper detail on the front. Both styles are lined front + back in BLACK for a high quality finish. The boys are going to HATE to see you go in this Miss Maneater boutique bikini pant, but they will LOVE to watch you go! 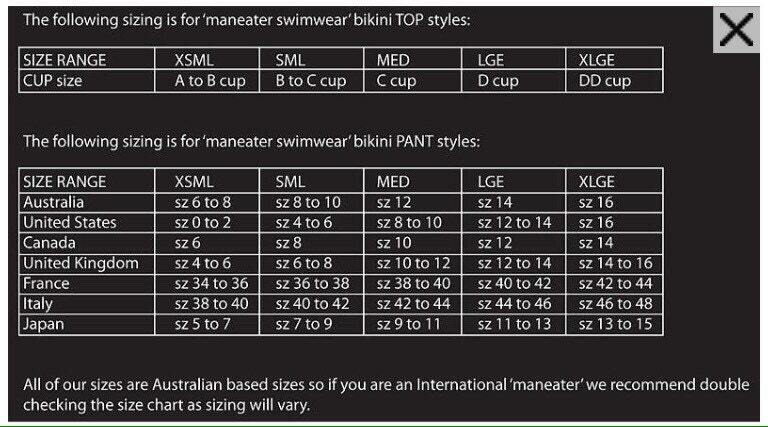 All MissManeater designer swimsuits & boutique bikinis are proudly designed, created and manufactured in Australia! Expect the BEST & you will get it....from US!